Immediately after pulling into the Camp Pollock campgrounds, you are instantaneously aware that you have been transported into a magical and wonderful place. 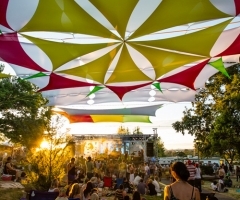 Tall trees surround the grounds while a calm Sacramento River flows just steps away from the stage. 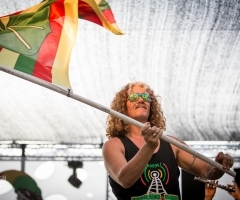 The fine folks of Reggae in the Hills did an amazing job kicking off festival season by hosting a two day celebration of art, people, food and music. 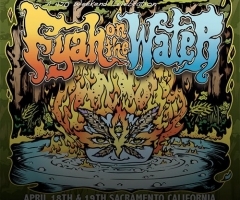 The festival appropriately named Fyah on the Water was a feast for the senses. The food vendors catered to practically every diet and filled the air with their outstanding cooking. The large selection of beer in the beer garden quenched the thirst for many standing under the blaring sun. Artists and fire dancers complemented the amazing musical performances throughout the night. There was something for everyone young and old. With all the amazing displays at every turn, the musical acts were at the center-most point. 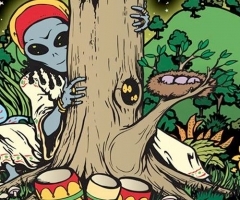 With musical guests like Tribal Seeds, Kottonmouth Kings, Marlon Asher, Potluck, Arden Park Roots, RBL Posse, Junior Toots, Mystic Roots, Indubious and many more, it’s impossible to not have a good time. Despite having to leave just after day one due to a family emergency, it was great to catch up and see familiar faces while connecting with new ones in such a beautiful setting. Until next time Fyah on the Water.